sewing guide: sweater knits more from back in stock! This rayon/nylon/poly blend sweater knit is a faux cashmere, luxuriously soft and buttery, lightweight yes opaque with fantastic drape. It has a sweatery texture and a tight knit, with 100% widthwise, 50% lengthwise stretch. The color is a soft, light blue melange mixed with white (PANTONE 14-4110). Fantastic!! 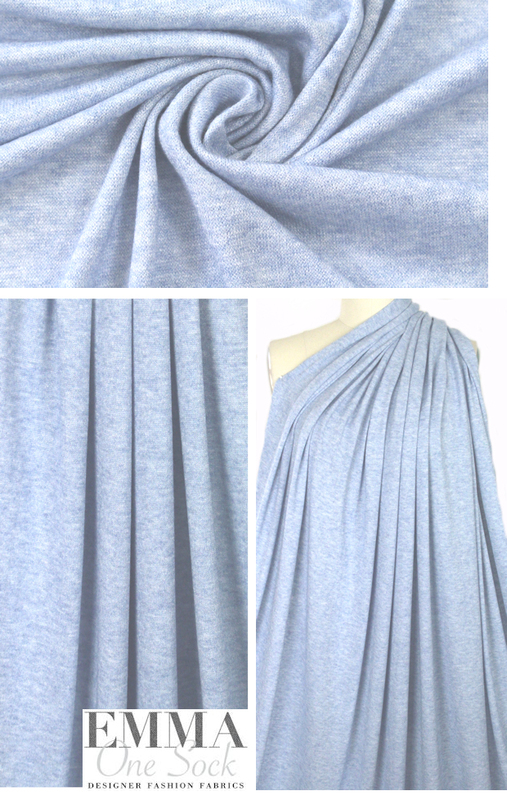 Perfect for a drapey cowl neck sweater, twinset, cardigan, pullover, top, infinity scarf, etc. The manufacturer recommends hand or machine wash, gentle, and lay flat to dry.